At the 2018 chili cook-off is State Senator Erika Geiss (left); State Rep. Darrin Camilleri; State Rep. Kristy Paganand; Michelle LaVoy, Monroe clerk/treasurer. The Southwestern Wayne Democratic Club is announcing that Congresswoman Debbie Dingell will be the special guest at their annual chili cook-off event. Date: Wednesday, April 24, 2019 from 6 to 8 p.m. 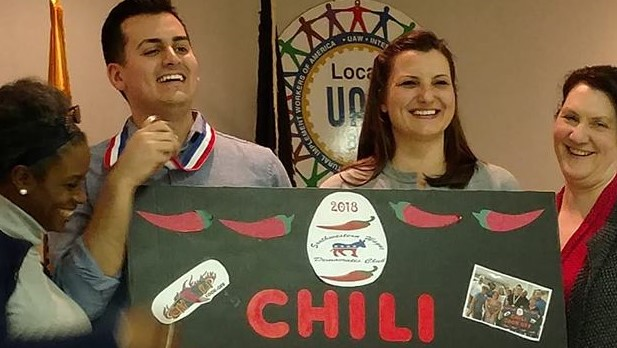 The club expects to be joined by local leaders, State Senator Erika Geiss, (a fierce competitor) and several state representatives, including Darrin Camilleri (former two-time chili cook-off champion) and Kristy Pagan (known for her delicious veggie chili). We are proud to provide a platform for the community to connect with their neighbors and representatives. WARNING: Keep an eye out as the other elected officials try and rip the medal off Rep. Camilleri’s neck. They are tired of him wearing his medallion on the house floor and mentioning his “award winning chili” at committee meetings. Our Corresponding Secretary, Debbie Chamberlain, will be trying to retrieve the title back from Trustee Barry Robinson who took the trophy for overall chili cook-off winner last year. Please join us for a fun and kid friendly evening! You can contact any Executive Board Member, David Haener or Terree O’Neil Darling on Facebook or terree22@gmail.com for tickets or join us at the door! This entry was posted in Events on April 12, 2019 by Scott Bolthouse.